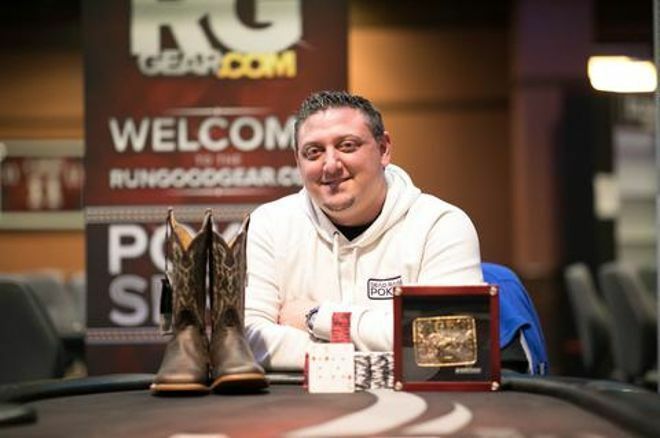 The RunGood Old West Poker Series at Downstream Casino Resort December 4-9 was another resounding success. The Main Event set a new record for attendance at the venue with 386 entries, trouncing the old record of 344 set in March of 2014. The weekend wrapped up with a surprise upset when Simon Webster of McKenney, Texas defeated RG Ambassador Daniel Lowery to take down the Main Event and the first-place prize of $44,391. The surprising thing about Webster winning the Main Event isn't that he won it. He's had 29 cashes this year for $178,735, including ten final tables and one championship. It's that he overcame a seven and a halve to one chip disadvantage to take down the championship. When heads-up play began between Webster and second-place finisher Daniel Lowery ($27,406), Webster held 915,000 chips to Lowery's 6,805,000. Webster won a couple of small pots and then received a full double up in a key hand when Webster hit a set on the turn. The blinds were 20,000/40,000, and with the board reading , Lowery bet 80,000 and Webster called. The river paired the board with the . Lowery checked, and Webster shoved all-in for 900,000. Lowery quickly called, and Webster tabled for a runner-runner full house. After the hand, Webster held 2,125,000 chips. Half an hour later, Webster again doubled when both players picked up big aces. Lowery raised on the button to 150,000 and Webster three-bet to 475,000. Lowery considered for a few seconds and then announced, "All in." Webster immediately called. Webster turned over , dominating Lowery's . The flop came , opening up the possibility of a chopped pot. The turn added the to the board. With a jack, Lowery would take the title, with anything else, Webster would assume the chip lead. The completed the board and Lowery shipped 2,285,000 chips over to Webster. In the final hand of the match, with the blinds at 25,000/50,000, Lowery called on the button, and Webster checked his option. The flop came . Webster led out for 75,000 and Lowery quickly raised to 200,000. Webster called, and the dealer added the to the board. Webster checked, and Lowery moved all-in. Webster snap-called, saying, "I call, I have the nuts," showing for the nut straight with a straight-flush redraw. "Do you really?" Lowery asked, turning over for a pair and a gutshot. Lowery could only chop the pot, but the came on the river, and it was all over. Webster had taken down the championship and its $44,391 top prize. This tournament marked the conclusion of the RGPS Old West tour. The RGPS spring season schedule will be announced next week.